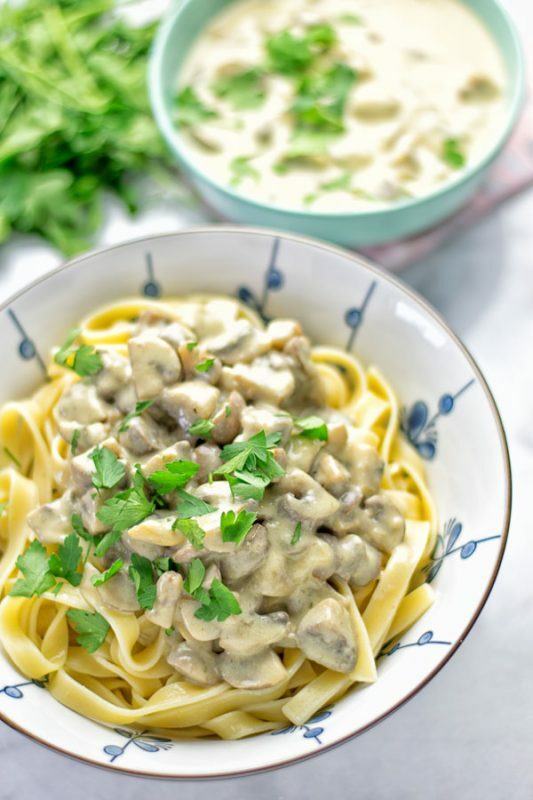 This lip smacking Vegan Mushroom Stroganoff is entirely plant based, gluten free and just so delicious to eat. Made in just a few easy steps with a base of cashew milk. So glorious. Sauces bring nearly every dish to the next level. In many cases, they are not only an extra but the most important part of the dish. I have always had a thing for sauces myself. 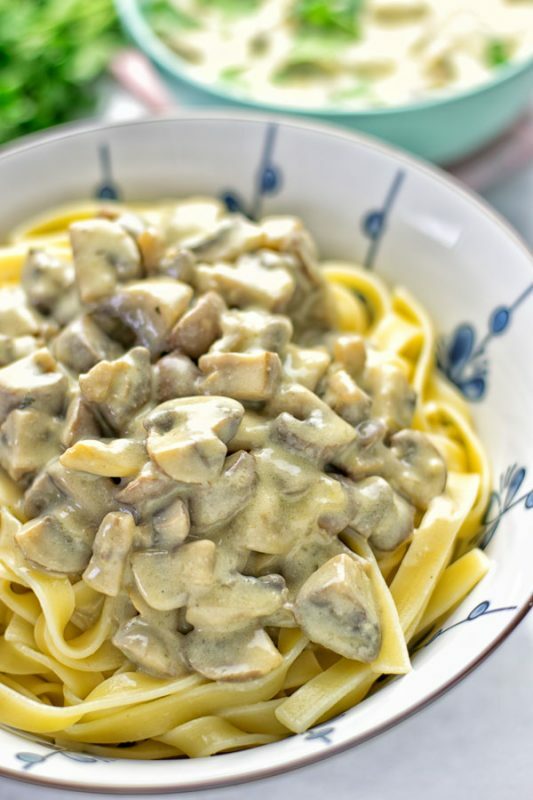 Come around and I’ll show you this Roasted Garlic Carbonara Sauce and my Spicy Tahini Pasta Sauce. You will be blown away by how easy to make and stunningly delicious they are. I put them over pasta or just it plain with bread. I dip, I taste, devour, and inhale. 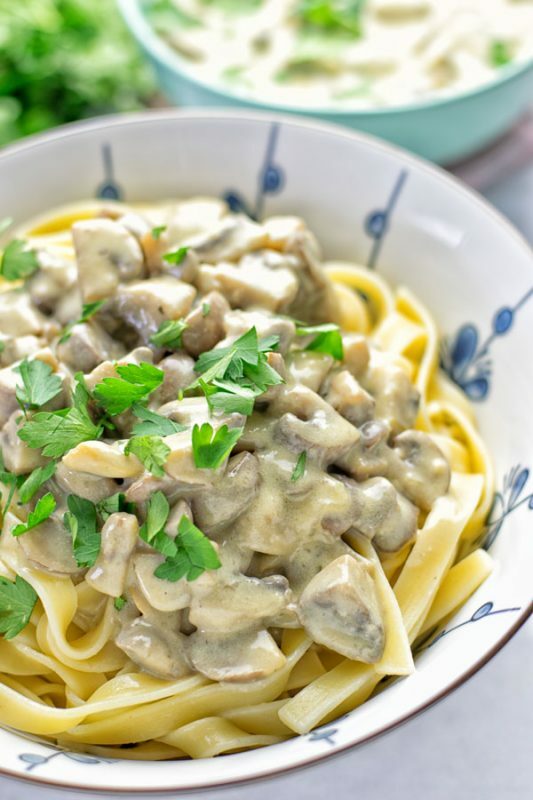 Traditional Stroganoff isn’t plant based or gluten free. It’s made with chicken, heavy cream, Parmesan, butter, and flour. 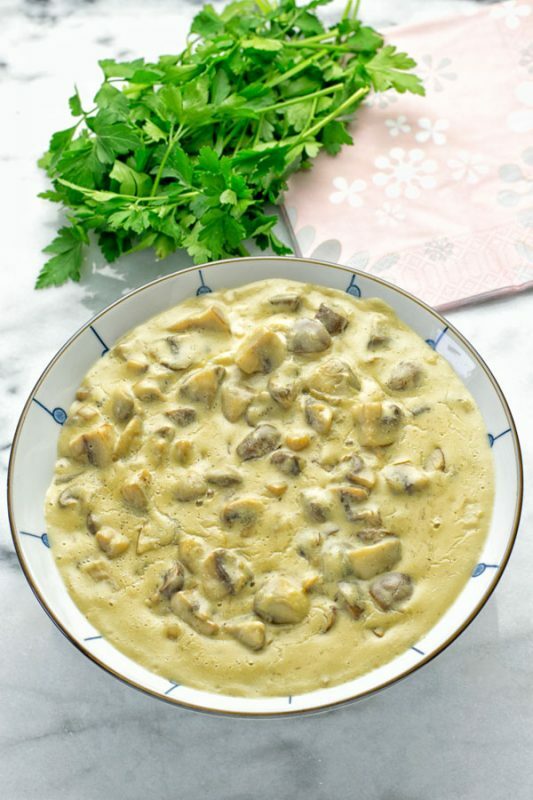 It’s hearty, super creamy, tasty, addictive plus incredibly satisfying, easy and so versatile. Yes! Enjoy it over pasta, potatoes or rice – there are so many ways! It couldn’t be any easier, just heat a bit of oil, or vegetable broth for oil free cooking. Fry the sliced mushrooms and the pressed garlic for around 5 minutes. Add cashew milk, tapioca starch, vegetable broth powder to that pot, as well as the optional add ons: white wine and nutritional yeast. Cook over medium heat for another 5 minutes. Whisk from time to time with a spatula. After 5 minutes it’s done, serve over pasta, potatoes, rice or eat just plain with bread. It makes an super easy and mouthwatering, lunch or dinner. You can even make it for date night. See it’s a match made in heaven for date night. 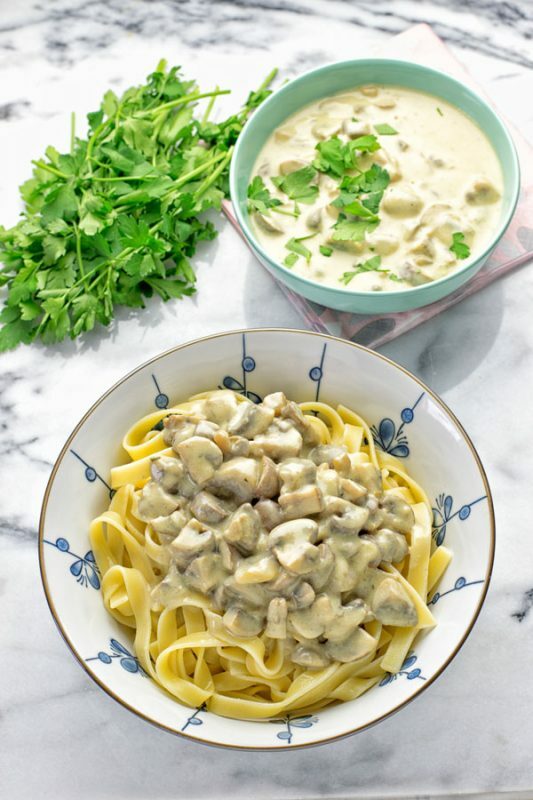 You can customize this Vegan Mushroom Stroganoff totally to your own liking by adding the optional add ons like nutritional yeast for more robust cheesy flavor, or some white wine. You don’t need that much wine so you can enjoy the rest with your sweetheart for serving. If you don’t drink alcohol, you can leave out the optional white wine. For sure the vegetable broth powder mixed with the mushroom juices and cashew milk will give it so much flavor. I tested the recipe also with almond and oat milk instead of cashew milk. It was still delicious and good but I think cashew milk works best. Coconut milk is a little different. I find the coconut flavor was just too dominant here. It tastes too much like coconut. Maybe you know the original or your family and friends aren’t vegan and definitely know how the classic recipe tastes. See it isn’t loaded with coconut flavors, or something else. Finally I can say cashew milk is definitely my favorite, oat and almond milk are still delicious, but only cashew milk takes this dish to perfection. Whenever you can, try to get your hands on cashew milk at your favorite store, try online or make homemade from scratch. Start by soaking your nuts overnight or use a quick soak for around 10 minutes in hot water. Now use 1 cup of cashews and 3 cups of water and blend until smooth. After that you will have to strain the milk, to filter out the remaining nut pulp. You can do that with a nut milk bag, cheesecloth or fine strainer, everything will work. You can use the nut pulp for yoghurt or quinoa bowls in the morning, or go savory for lunch and dinner with a veggie stir fry. I do not sweeten my nut milk. But if you like it a bit sweeter, you can add 3 pitted medjool dates, 2 tbs maple, agave or coconut syrup. Cashew milk will store in the fridge for 3-4 days. 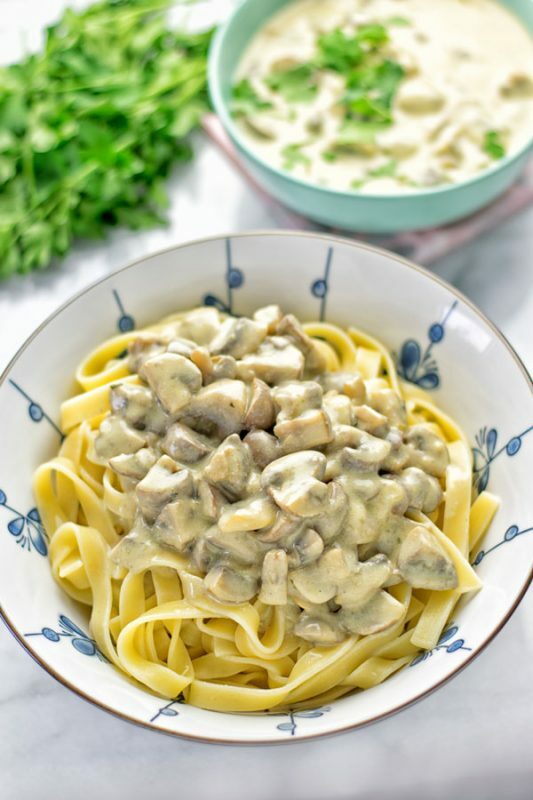 If you give this Vegan Mushroom Stroganoff a try, tag me on Instagram and Facebook. 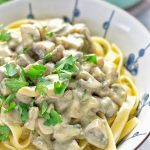 This lip smacking Vegan Mushroom Stroganoff is entirely plant based, gluten free and just so delicious to eat. Made in just a few easy step with a base of cashew milk. So glorious. Heat a bit of oil, or vegetable broth for oil free cooking. Fry the sliced mushrooms and the pressed garlic for around 5 minutes.